On heels of tragedy, it’s back to business. As usual, Seattle is ahead of the curve (apologies, Renton). 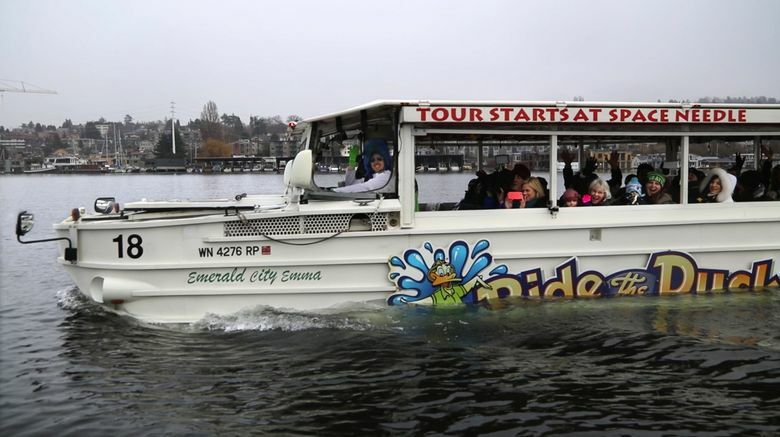 It was with great excitement that Mr. Wrap, along with the rest of y’all, learned that “Ride the Ducks,” the city’s greatest single tourist attraction — not including the Dale Chihuly Monument to Himself / Twisted 7-Up Bottle Outlet Warehouse — has careened right back into business. Thanks, owner Brian Tracey and Mayor Ed Murray, D-Velopment, for pulling the Scary Bridge City back from the edge of tourism oblivion! Sure, the Ducks had a devastating safety hiccup a while back. Stuff happens. But here’s a chance to market ourselves as a new adrenaline-junky tourist destination competing with other top contenders, such as bungee-jumping Queenstown, New Zealand, for death-defying greatness. • Pickups at the Space Needle. Drop-offs: Who knows?! • Safety, Schmafety! The Ducks’ sweaty-palms record 442 safety violations in only three years is in a league with true thrill-ride giants, including creaky cliff-clinging buses in Honduras and the industry king, General Motors. Look it up! • Did you know? These amphibious landing crafts weren’t originally built for sightseeing! Oh. Sorry. That last one is an actual blurb from the company’s website. Seriously, Folks: We’re in no way casting light here on that tragic accident. The opposite, in fact: Is getting these clunky vehicles back on the road really critical enough to risk another one? Don’t Be Too Hard on Scott: That’s the sort of psychological transference people often engage in after pointing the U-Haul toward insignificant cultural black holes like College Station, Texas. Speaking of Corporate Welfare: And now comes Jeff Bezos, hat in hand, to join the long line of insanely rich people seeking a public handout to do business — building engines for his rocketeering hobby — in Washington state. Take a number, Lex. Cow College Hilarity, Cont. : So a former assistant prof at WSU, looking for ways to convert cow poop to electricity reportedly faked data in a study on same, and now profits from the deceit by working for a company that specializes in cow-poop digesters. That’s Cougin’ it gold right there, folks. And Finally: We have to admit, it was creative of TV network Fox Business to broadcast that two-hour GOP debate Thursday night. You almost couldn’t tell that it was stitched together entirely from old newsreel files saved from the height of Cold War paranoia in 1959.